SALINAS, Ecuador (Reuters) - Venezuelan opposition leader Juan Guaido left on Sunday from the Ecuadorian coastal town of Salinas after announcing his intention to return home to lead new protests against President Nicolas Maduro, though his route back remains unknown. 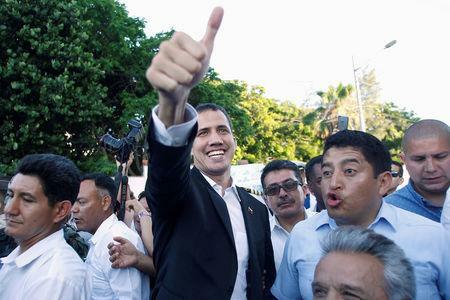 Guaido, who has spent the past few days touring Latin American nations to gain support, departed Salinas aboard an Ecuadorian air force plane headed for the port city of Guayaquil after meeting Ecuadorian President Lenin Moreno on Saturday, Reuters witnesses said. "Thank you to President Lenin for his deep support to our cause," Guaido said on Twitter. From Guayaquil it was not clear where he would fly to next. To arrive in Caracas by Monday, he could take commercial flights from Bogota or Panama City, though his press team kept details of his route under wraps. Guaido flouted a court-imposed travel ban last week when he crossed into Colombia to coordinate efforts there to send humanitarian aid into Venezuela, though troops loyal to Maduro blocked a convoy of aid trucks and turned them back. His return opens the possibility that Venezuelan authorities will try to arrest him. The Supreme Court had imposed the travel ban after he invoked the country's constitution on Jan. 23 to assume an interim presidency, which most Western nations now recognize as legitimate. Maduro says Guaido is trying to foment a U.S.-backed coup against him. Guaido, head of Venezuela's opposition-controlled congress, on Saturday called for new protests on Monday and Tuesday during the Carnival holiday period.